Now, I’m far from a wine buff, and an infrequent food critic, but when Emily needed someone to step into the breach and attend this event, it didn’t take a great deal of persuasion. In Bristol we are spoilt for choice when it comes to quality eateries, which means that sometimes the outlying villages don’t get much of a look in, which is a shame, because as I found out there are great things afoot in the country! My foray into French wine and dining took me outside Bristol to the calmer environs of Chew Magna. Our venue for the evening was the Pelican, affectionately known locally as the “Pelly”, right in the centre of the village. From outside it looks like your average country “gastro-pub” and the theme continues inside with a sympathetically restored interior including two open fires. I was intrigued to see a sign advertising a boules pitch to the rear of the pub and an inviting courtyard and garden, I suspect that this could be a wonderful spot for alfresco Sunday lunch. The Pelican was purchased three years ago by a syndicate of 4 local businessmen with a wealth of experience in the hospitality and hotel fields. Within the syndicate were the owners of the successful Bear and Swan, who brought with them Robert Lyle, now the head chef at the Pelly with Nicholas Hann as his second-in-command. The broad aim of the Pelly is to provide Bistro-style modern dining in a rural setting, although the menu stays true to the Pelly’s country pub roots with a varied but solid selection including steaks, pasta dishes and interesting-sounding meat and fish “Planks”. There is a good selection of daily specials, and plenty of inviting lunch options including various inventive, fresh salad options. The Pelly also do regular themed evenings in the function room where we dined. Behind the bar there is a large selection of wines, clearly this is a point on which the Pelly prides itself. I was rather disappointed to see a limited collection of ales on tap, although possibly this is a function of the pub’s clear emphasis on dining. When we arrived at 7pm there were a good number of people dining downstairs and a healthy buzz around the bar. Our hosts for the evening were Bibendum Wine, a specialist supplier based in London for the last 30 years but with a good local presence and the rare distinction of remaining totally independent in these days of Pubcos and global conglomerates. The evening was intended to showcase the wares of Domaine LaFage, a family winery based in and around Perpignan in Southern France. LaFage’s Commercial Director Ramuntxo Andonegui was on hand to provide interesting insights on each wine showcased. 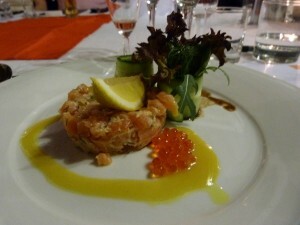 The meal started with salmon tartare with creme fraiche and lemon. An elegantly presented dish, with creme fraiche presented in a cucumber “pot”, the colourful addition of salmon caviar on the side and a small, light side salad. The salmon was fresh and zingy, pleasingly unencumbered by breadcrumbs or other distractions. The creme fraiche was quite simply delicious and the salmon caviar a good salty contrast. 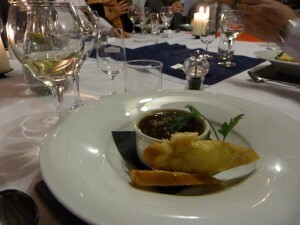 A really good start to the meal, and paired well with a delightful Cotes de Rousillon Centaire Blanc. Throughout the evening the clear French theme was apparent, the second course being a traditional onion soup with French bread and cheese. My dining companion remarked that it was quite some time since she had experienced such an authentic, good quality French onion soup, and I can only agree wholeheartedly. The soup had a rich, caramelised taste due no doubt to hours of preparation and reduction and a keen eye for what makes a simple dish great. We moved on to the main course, and I must confess that whilst my initial impression of the dish was not positive, I was fully converted by the last mouthful. 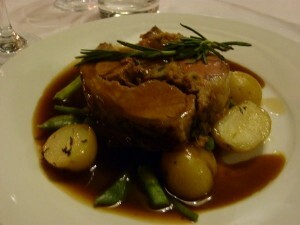 A frankly humungous slab of lamb was simply presented on top of seasonal vegetables, with new potatoes and gravy, together with a wonderful herby stuffing. My initial impression could not have been more wrong. It is a sad truism when dining out that large joints of meat sometimes fail to deliver the flavour achieved with smaller cuts, however this was by far the best lamb that I have had for some time. Cooked to perfection, superb flavour with a genuine “melt in the mouth” consistency which can elude the home cook at the best of times, let alone an evening with over thirty covers. The vegetables again were cooked to that point of rare perfection where they retain a slight “crunch”. The only possible criticism I could bring to bear on this marvellous ensemble is the slight surfeit of gravy on the dish. The main course was paired with a thoroughly pleasing Cotes de Rousillon Rouge Authentique- In general I fall very firmly on the side of white wines however this complemented the lamb perfectly, with a rich, complex body and strong fruit flavours without being overbearing. And so the cheese course came, a marvellous showcase of good local cheeses paired with biscuits and delicious fresh figs, paired with a delicious dessert wine, Rivesaltes Ambre Els. This is matured in barrels according to the Solera System, where only 30% of the barrel is decanted and refilled, which helps to maintain the “fresh” flavour of the wine. 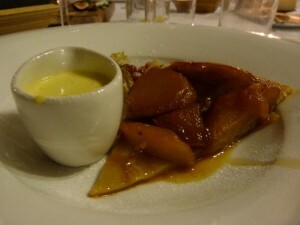 Finally we moved on to dessert- A typically French tarte tatin with creme anglaise, paired with a Muscat de Rivesaltes. I can’t pass comment on the Muscat, however the Tarte Tatin was superb, with a syrupy, homely feel with undertones of toffee, paired with a light, fluffy Creme Anglaise. And so midnight came, and the return journey to Bristol. In hindsight driving to a wine dinner and hence only enjoying the merest of sips of each offering might be considered a slight tactical error however this did have the benefit of enabling steady photography throughout the meal, tasting notes that I can still read after the event and an enhanced wine allocation for my dining companion. I can safely say that it is an establishment which I will be returning to, although possibly with a designated driver next time! 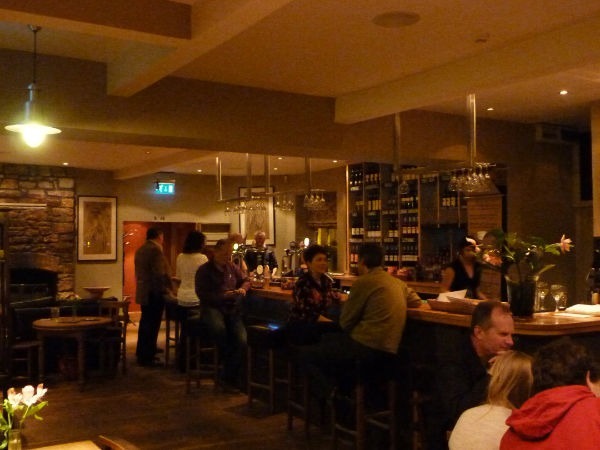 The refreshing ethos of the management, coupled with Robert Lyle’s inventive, fresh approach to the menu make the Pelican is a venue well worth leaving Bristol for! Many thanks to Sam Donati (Samdonati@hotmail.com) for the review!